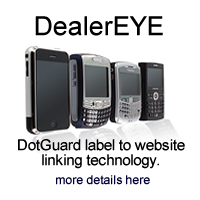 DotGuard offers high-quality anti-theft protection products to suit a wide variety of applications. We specialize in custom OE programs and theft deterrent solutions for automotive, RV, marine, and powersports dealerships and their customers. Our advantage lies in our ability to customize all our products to provide an end-to-end theft deterrent solution. We are more than a product supplier, we offer our customers US Government & ISO standards compliance, advanced tamper resistant/ UV-IR imprinting, chemical etching, and in-field readability via our DealerEYE smart phone technology. All our programs are backed by our global National Vehicle Register and growing partner network. Theft deterrence is more than just a product, it is a complete industry solution. Access Dealer Registration System Here.